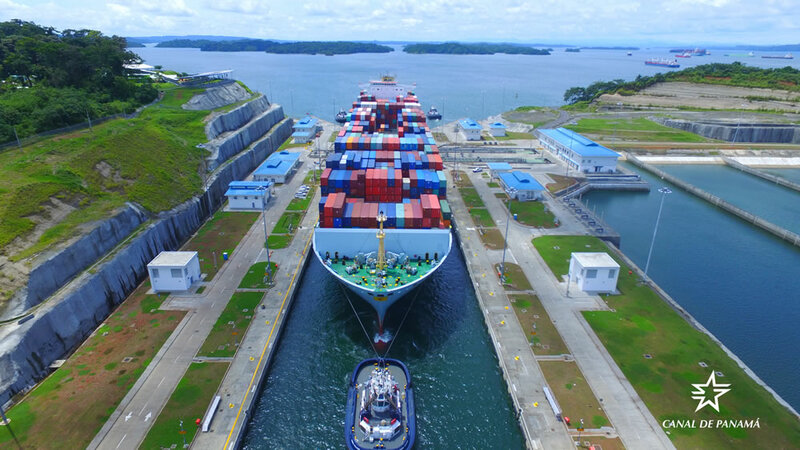 Yesterday, for the third time since the inauguration of the Expanded Canal, the Panama Canal set a new monthly tonnage record of 38.1 million tons (PC/UMS) after facilitating the transit of 1,231 vessels in May 2018. The previous record was established in January 2017, when 1,260 vessels transited 36.1 million tons (PC/UMS) through the waterway, just a month after setting the record with 35.4 million tons (PC/UMS) transited by 1,166 vessels in December 2016. The container ship segment contributed highest tonnage (36%), breaking its segment record with 13.8 million tons (PC/UMS) transited by 229 vessels. “This new historical milestone reiterates the positive effect of the Expanded Canal and is further proof of the continued confidence of the maritime industry in the Panama Canal, and the impact it will have on the future of world maritime trade,” said the Panama Canal Administrator Jorge L. Quijano. Thanks to the increased cargo capacity offered by the Neopanamax locks inaugurated almost two years ago, the Expanded Canal has received around 3,800 Neopanamax vessels, around 50 percent of which are containerships. The waterway has also welcomed liquefied petroleum gas (LPG) and liquefied natural gas (LNG) vessels, as well as bulk carriers, tankers, cruisers and vehicle carriers. • March 1 – MSC Caterina became the 3000th Neopanamax vessel to transit the Expanded Canal, reaffirming the interoceanic highway’s impact on world maritime trade. • March 7 – The Panama Canal added an additional reservation slot for Neopanamax vessels, raising the total available from seven to eight per day. • April 17 – The Panama Canal facilitated the historic transit of three LNG vessels, the Clean Ocean, Gaslog Gibraltar and Gaslog Hong Kong, in one day. • May 14 – The Panama Canal facilitated the transit of its largest cruise ship to date, the Norwegian Bliss operated by Norwegian Cruise Lines, weighing more than 168,000 gross tons and carrying the capacity for almost 5,000 passengers.